I carry the little Lumix mainly for capturing motion blurred light trails in the rain at night as I drive home from work. One of my favorite things, as it combines luck & surprise. 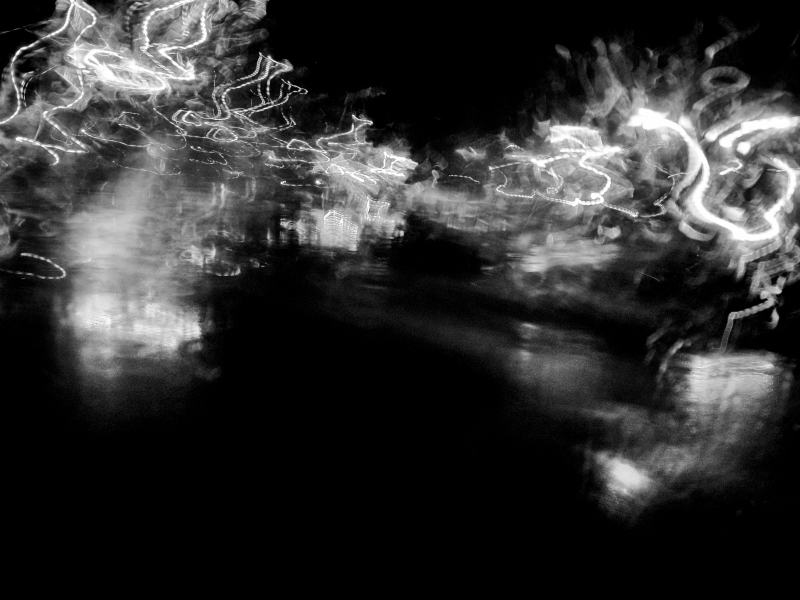 In BW they become quite abstract. I see brightly lit Chinese pagodas :-) Very cool! This is cool, the longer you look at the more you can see...if your mind lets you. I'm see faces at the moment. You always have the best ideas for getting abstracts. I bet this is cool in color too. Definitely Mardi Gras beads.... I see a dog too. I'd think this would be abstract in color, too :) Dancing. I've never done this because I'm the one who drives and besides I rarely drive at night (hate it). I bet you get some cool abstracts like this! It's electric! Makes me want to dance! Looks like a battle between wiry-haired heads. No bodies, just heads. I have a Lumix. They do make great abstracts. This looks like a party! Interesting. You can see animal shapes in it, like kangaroos. Proudly hosted by Sargasso Networks. Current Server Time: 04/18/2019 04:18:44 PM EDT.